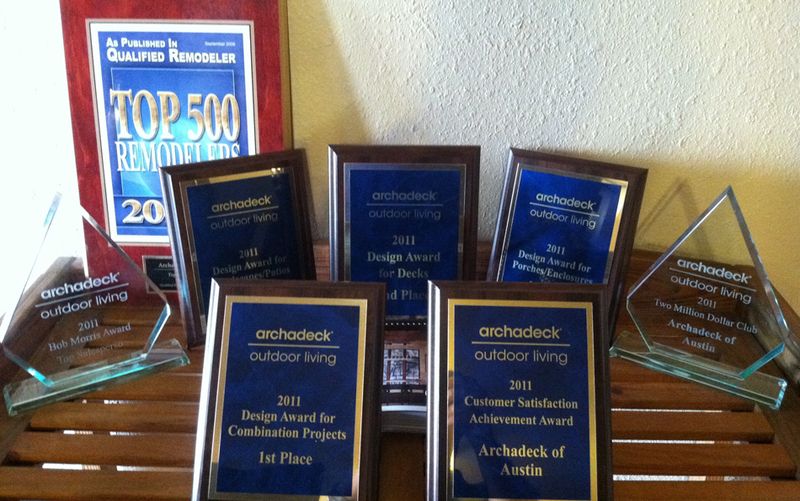 Archadeck of Austin begins the construction on this one of a kind patio. Do you remember the dance scene in the Sound of Music where Georg and Maria dance on the outdoor patio to the folk tune? There are so many enchanting elements of that scene and one of them is certainly the fact that they are outside on a private patio. 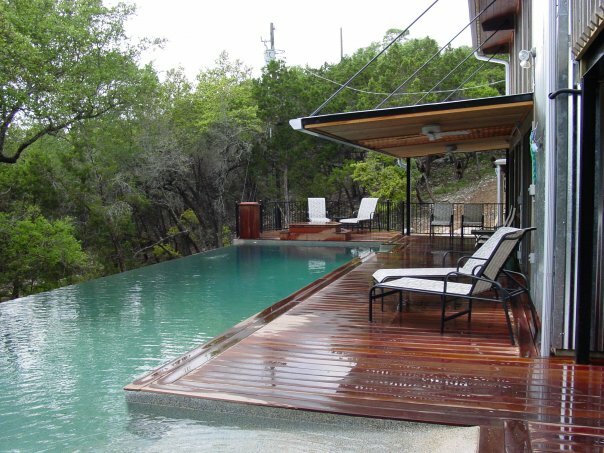 These Austin owners commissioned a large double concrete patio for just that purpose – dancing. They love to entertain and both they and their friends love to dance. 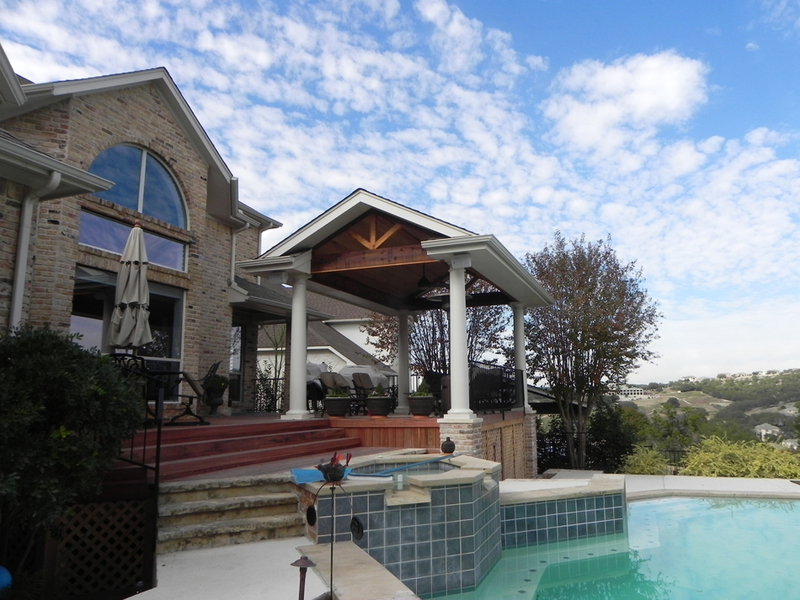 What better than an outdoor entertaining area made for both dancing and socializing? 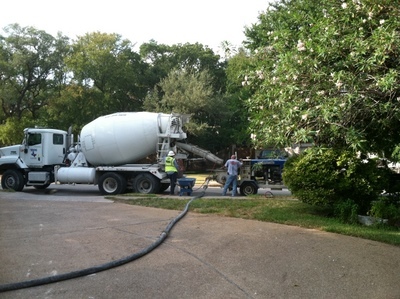 This image shows the concrete beginning to be poured over a long line. From a logistical perspective, there were some challenges. 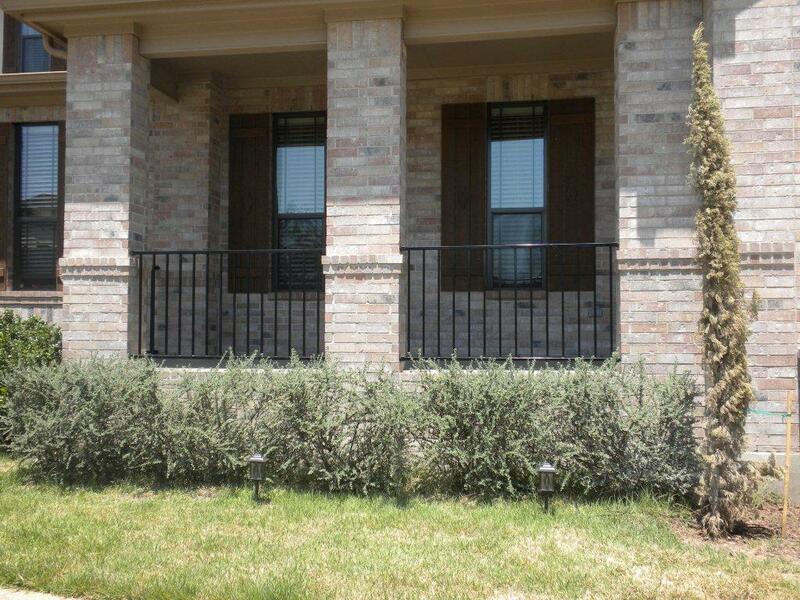 The homeowners have a utility easement that restricts them from building a normal structure and are limited to a low profile patio. 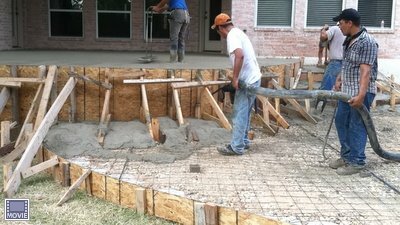 With this in mind we were able to create a huge patio and then a second patio three feet higher which is closer to the home itself. 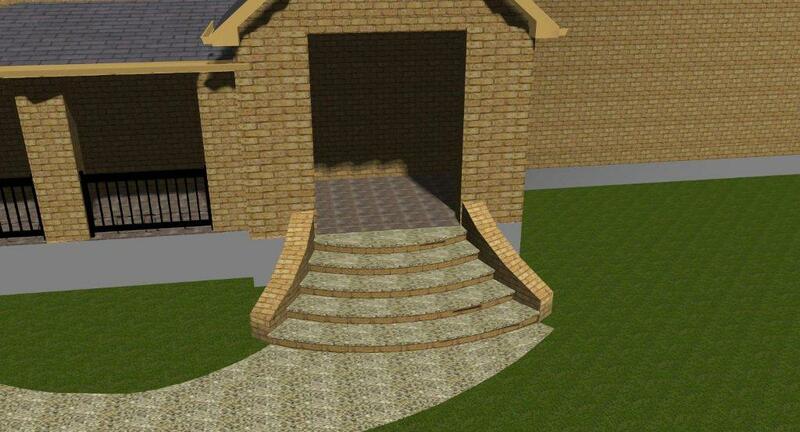 This gives the patio a tiered effect, which enables the homeowners to create a grand entrance when leaving the back of the house by descending onto the semi-circle patio and then down to the lower patio to reach the dance floor and fire pit area. 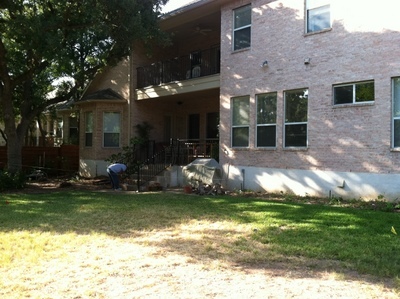 This is the home before construction began on the multi-level, tiered patio. 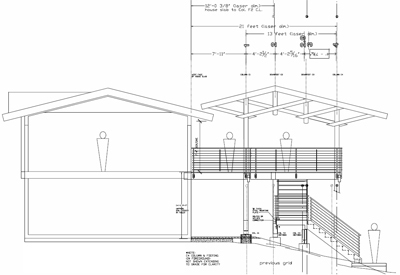 The structure will also include a nine foot outdoor kitchen on one end, a custom fire pit and custom built-in bench seating to take a breather after dancing the night away. The fire pit can also inspire romantic evenings with a slow dance or two by the light of the fire. 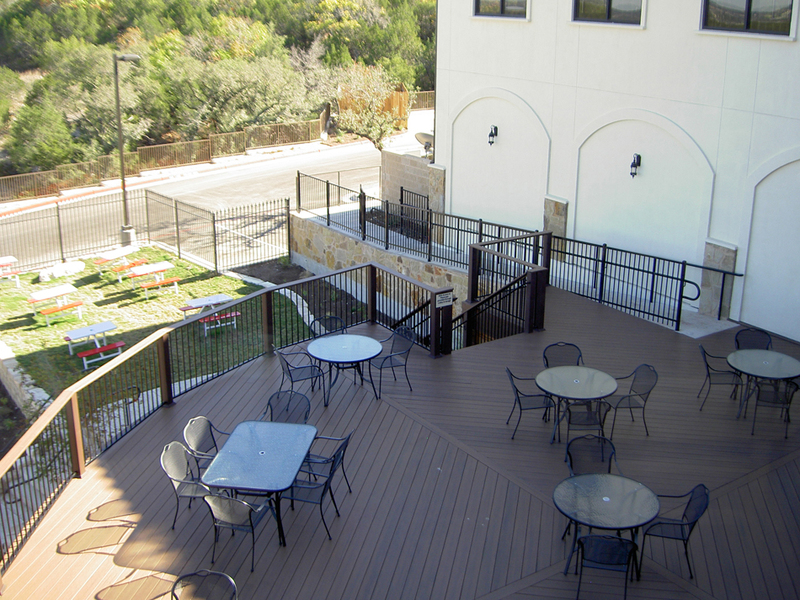 Archadeck of Austin was able to weave the customers personality and tastes into this design to give them an outdoor structure, that against all the odds and structural confines, will give them exactly what they wanted-a place to dance, and much, much more. 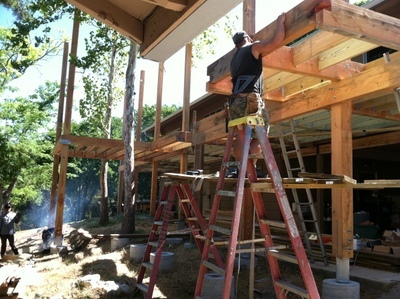 The structure should be completed in about a month, and we can’t wait to share photos of the finished structure with you. 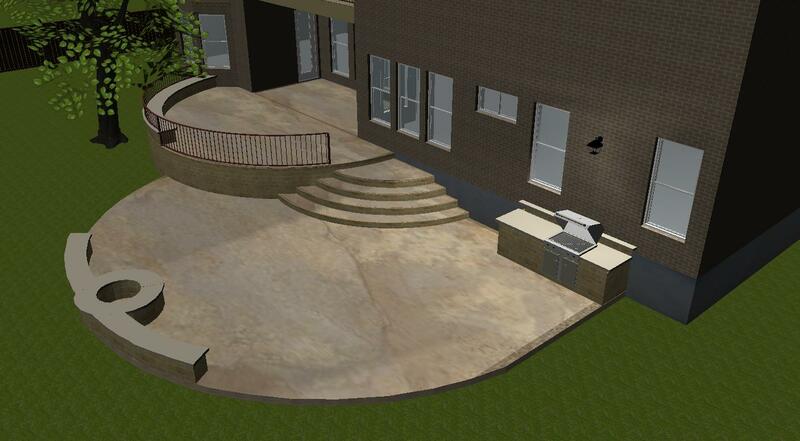 These homeowners look forward to taking center stage for their first dance on this one-of-a-kind patio. 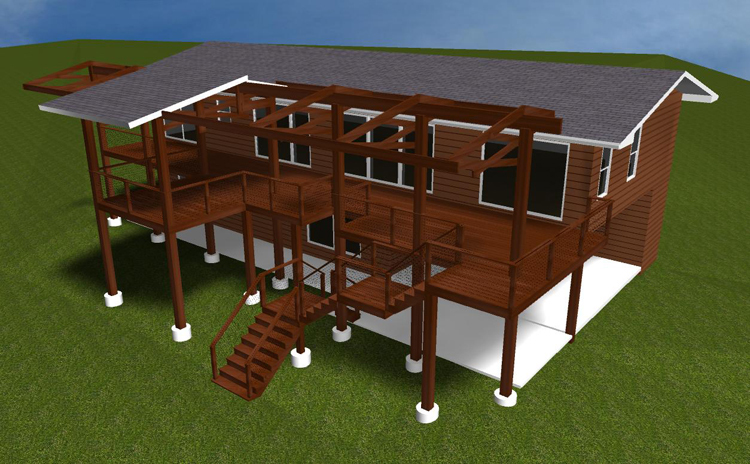 This design rendering by Archadeck of Austin shows the upcoming patio in all it's glory, with dance floor, retaining wall, kitchen area and fire pit. 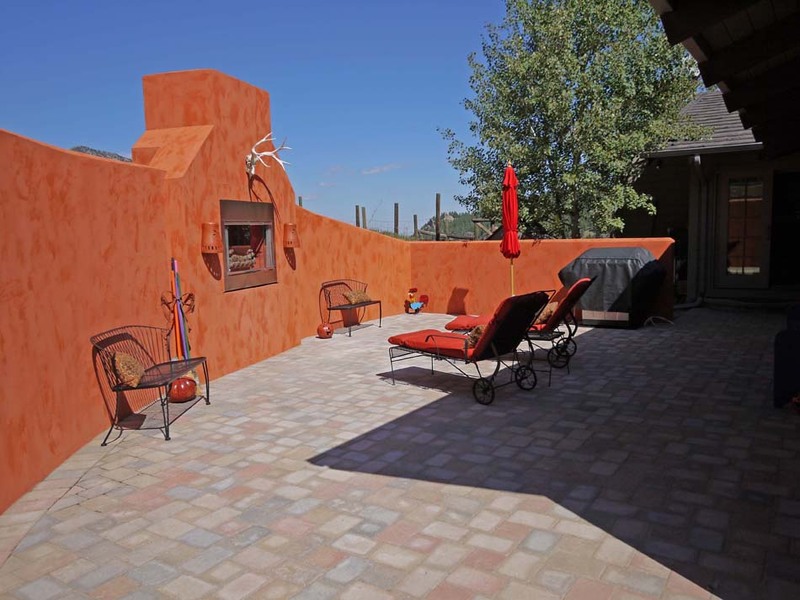 You can also see more beautiful and unique patios by visiting our photo galleries on our web site. 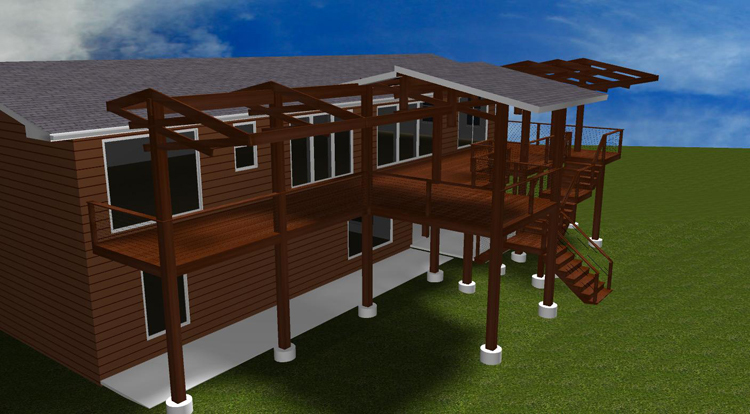 We rebuilt the majority of the structure using TimberTech Reliaboard in Cedar. This particular color of Reliaboard is clean and at the same time has a rustic essence. 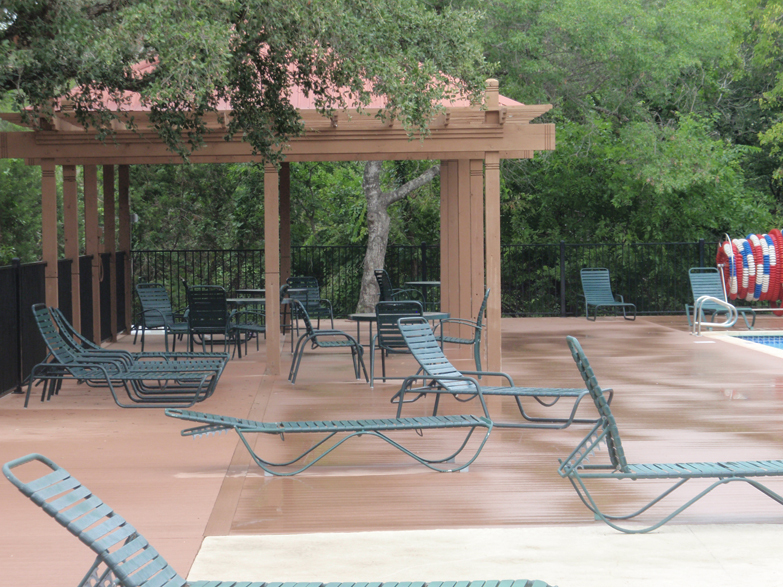 Since one of the areas of the pool surround was not level, we added the level decking surface. Some of the existing material was reusable but we had to add some masonry work to the pool surround and build a limestone partition to avoid tripping hazards. 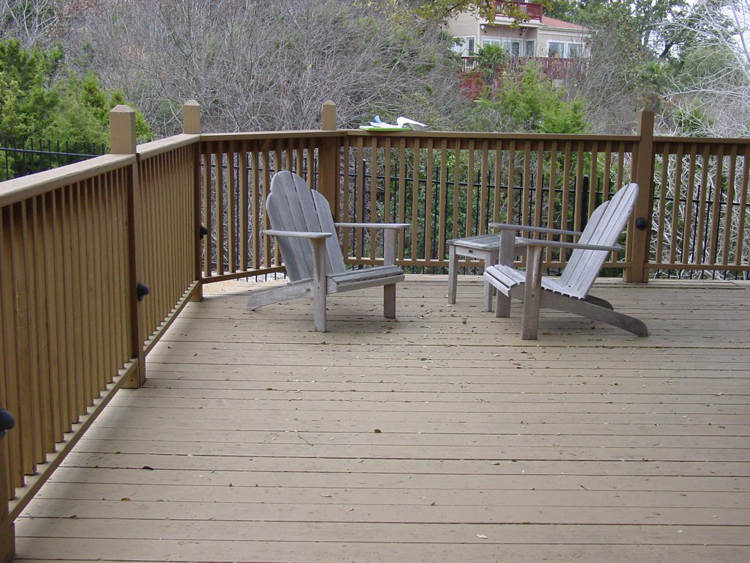 Among the obstacles to overcome with this re-decking was a tree that came up through the deck. 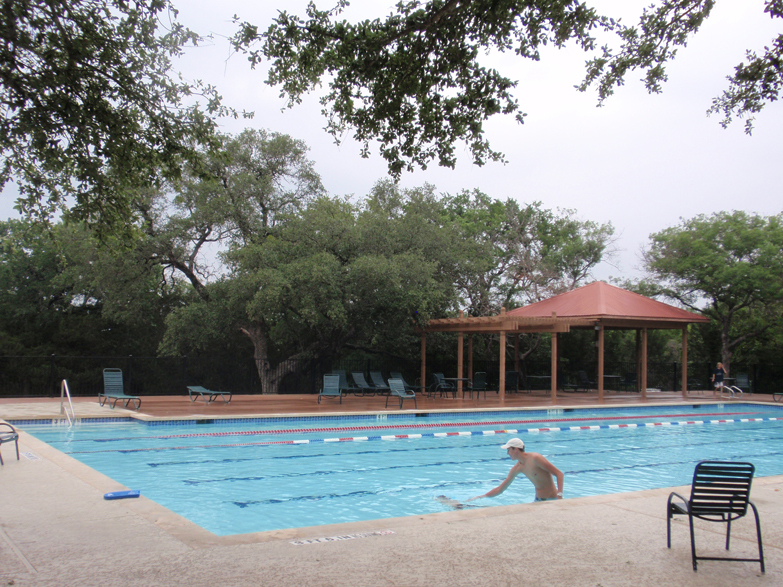 Steiner Ranch is known for its beautiful old trees. So encountering a tree poolside was no surprise. 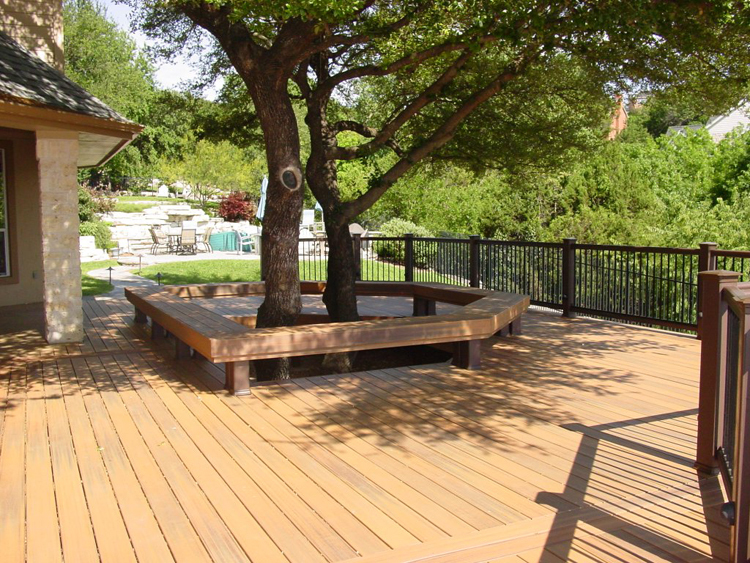 This unique feature required us to create a hexagon type ring made from decking boards which surrounds the tree at the deck level but is not attached to the deck surface. 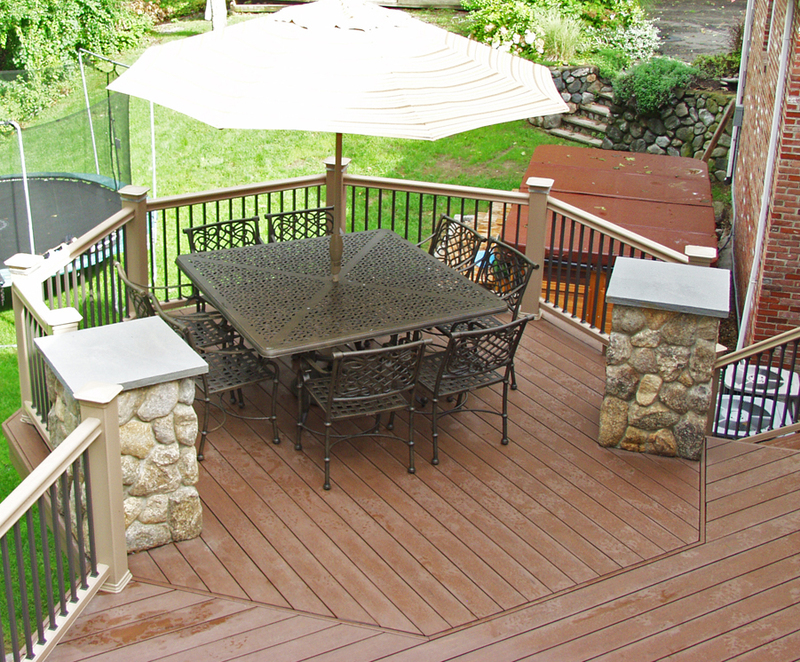 This allows room for the tree to grow, but not enough room to leave a gap that a child could possibly lose a toy in under the deck. 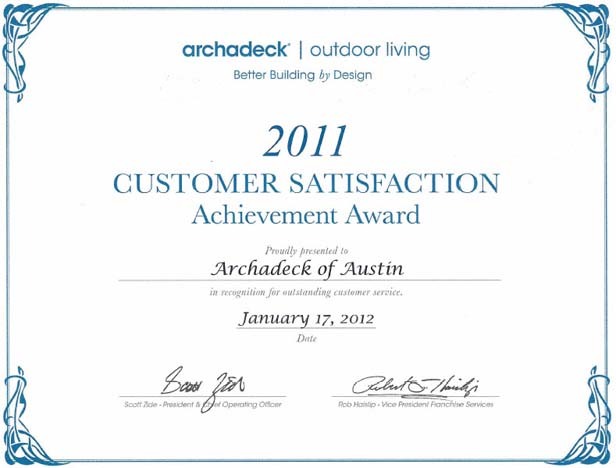 Safety is always important at Archadeck of Austin and is priority number one on all our constructions. Since the structure had previously been constructed of plastic it had become brittle and wavy from exposure to the sun. 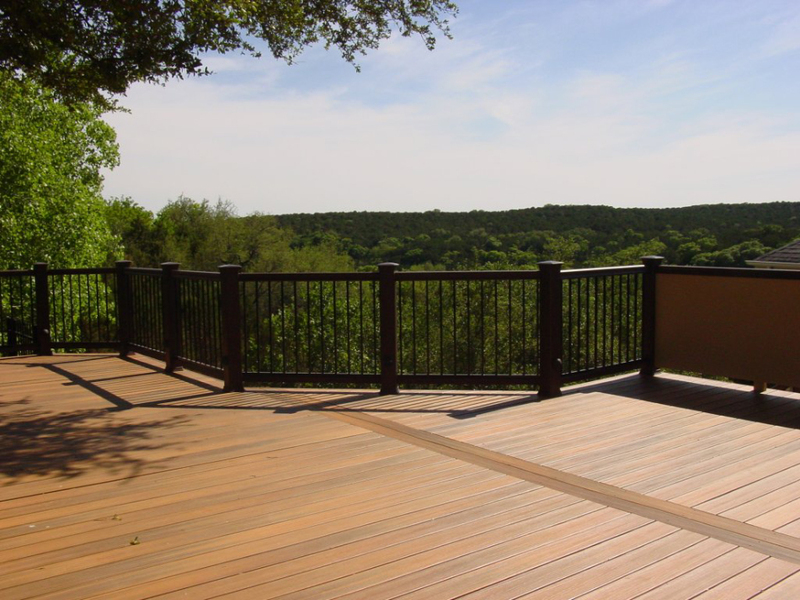 The new composite decking material we used is easy on the feet on those hot summer days and is also extremely durable and low maintenance. 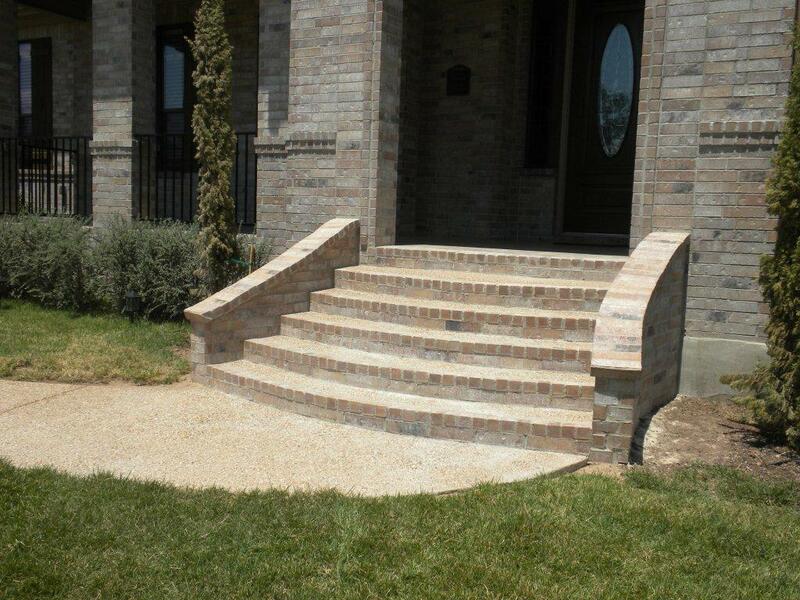 This composite has the realistic appearance of beautiful cedar as well. 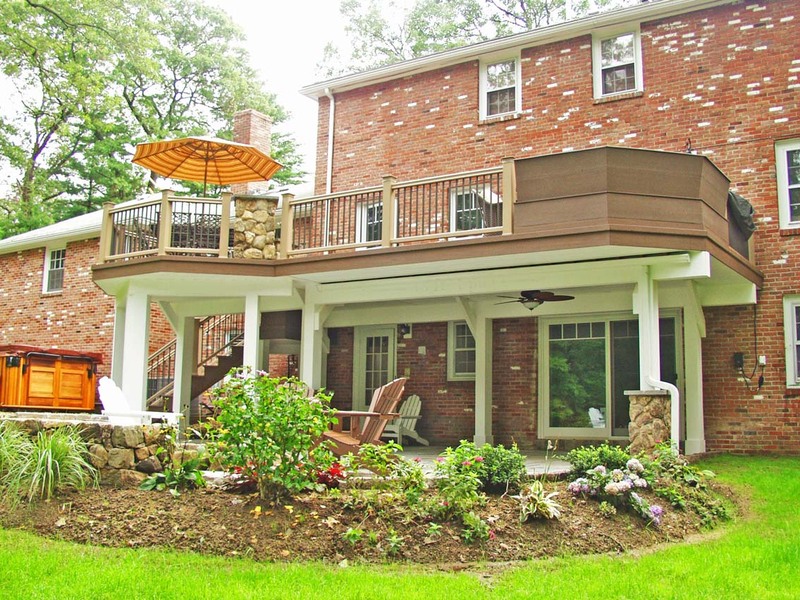 The supports of the existing pergola had been damaged by carpenter ants and required re-enforcement while we were completing the re-decking on the pool area as well. 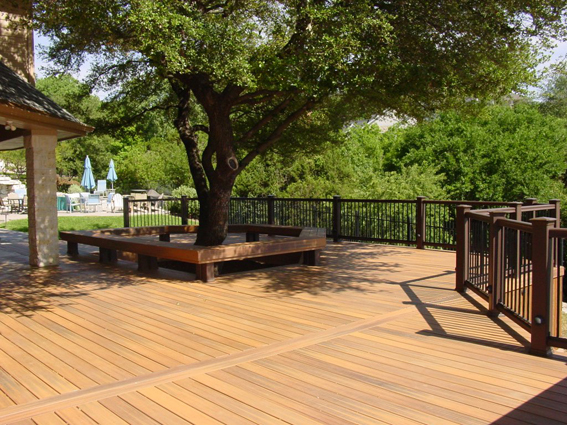 The residents of Steiner Ranch love the new re-decking. It has all the beauty of real wood without the headaches. 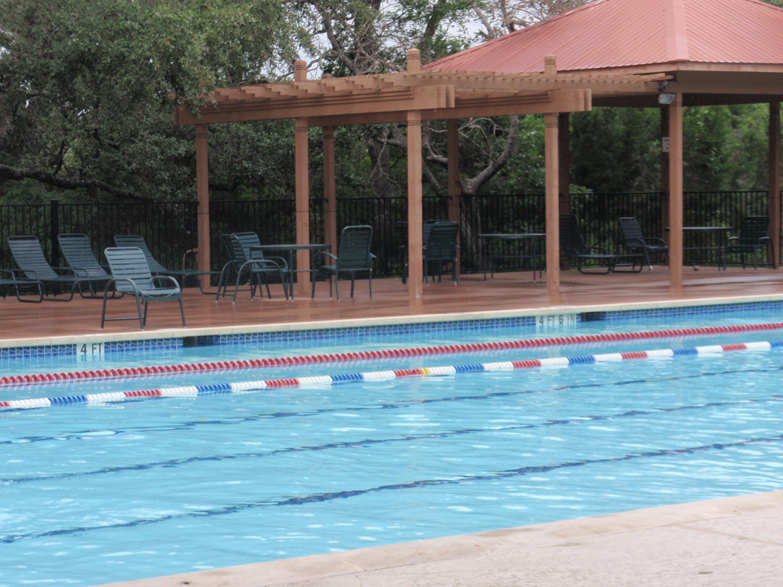 Now residents can kick back for an afternoon by the pool surrounded by the same quality and beauty that is visible throughout this entire community. 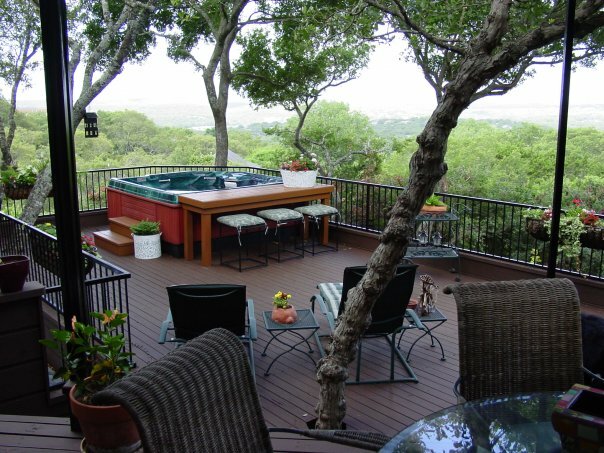 Recently Archadeck of Austin put in a patio complete with benches and topped it off with a flower bed with pedestal lights for this homeowner. Much to our dismay there was an electrical issue. The homeowner wanted separate switches inside the residence to control the two sets of lights we installed atop the pedestals and the two recessed lights we installed into the sides of the pedestals. 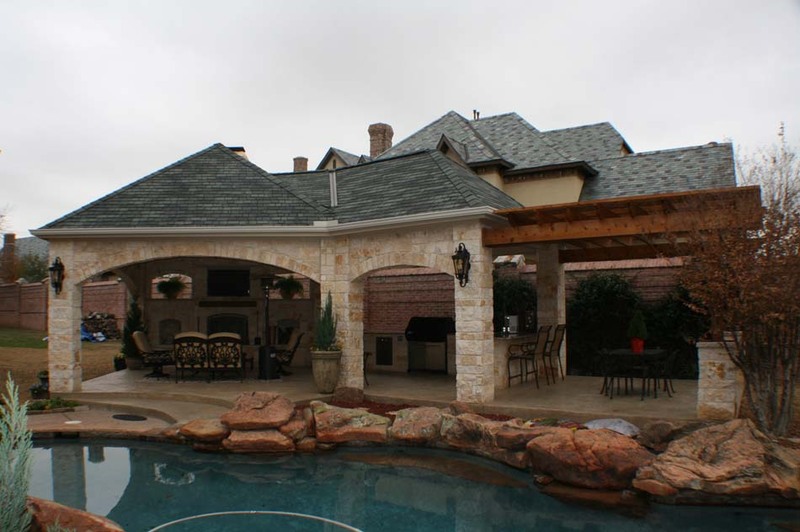 The recessed lights were low voltage, and the post lights were the large lights on the pedestals that lit up the patio. In the end we ended up with lights which were controlled by a wireless remote. 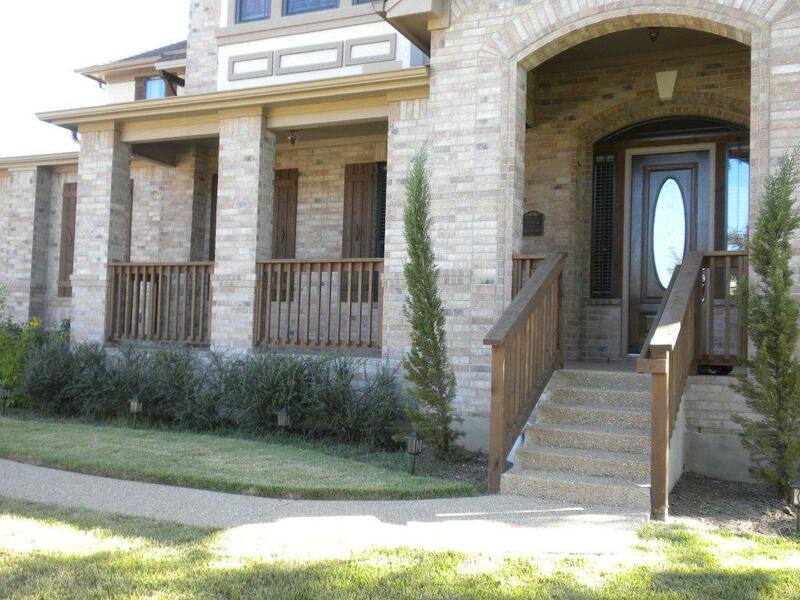 This made the homeowner ecstatic, now she keeps the remote control handy in her home, and the receiving box was able to control two different sets of lights. The unique challenge we faced with this job was to hide the wiring. The electrician that we worked with was very creative in coming up with the wireless solution. Our project manager on this job really outdid himself this time on making sure every t was crossed and every i dotted, to ensure the safety and happiness of the homeowner.